During periods of uncertainty in my life, I find it very beneficial to scribe or score all the pros and cons for the decision confronting me. As Joni Mitchell once advocated in song, “I’ve looked at life from both sides now”. This forces one to look at the dilemma from all angles, and not necessarily from the side that agrees with one’s instincts. I have on occasion, gone through this process and then slapped myself in the face when I was finished due to the revelation that resulted. Looking at the recent market volatility this way, I found this process beneficial but it didn’t lead to an epiphany. I will let you weigh the evidence with me and draw your own conclusions. Like most indicators the January Barometer is not infallible, but I believe it has a place in a student of the market’s tool bag. Since 1950, the S&P (excluding dividends) was up in the last 11 months of the year 74.5% of the time for an average gain of 7.4%. Below are statistics for the last 11 months of the year based on January’s performance. January 2010, did not give the rest of the year it’s endorsement, by starting the year off with a 3.9% loss. As 2009 proved, the January effect is not a flawless barometer, but the odds in the above table are worth making a note of. The January Barometer is back in play for the time being. On Thursday, May 6, the S&P 500 cash was down 8.6% intra-day before finishing the day down 3.2%. For this study, I defined a capitulation day as any day that was down on the S&P by at least 5% at any point intra-day. 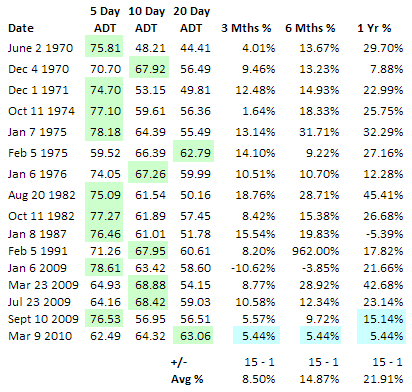 There have been 31 prior 5% plus intra-day selloffs since 1970. The results show lower than average performance for 1, 3, and 6 months but higher than normal average performance for 12 months later. These statistics are driven almost entirely by the fact that 13 of the 31 data points occurred in 2008, which all had 6 additional months of declines and a powerful rally thereafter. Since we are not at the bottom of a 12 to 24 month bear market, I felt it prudent to refine my search to capitulation days closer to previous highs. Honestly folks, I didn’t get a lot of help here, but I shared in case you case can gain anything from it. I think it is important to step back and put in perspective the fact that since the March 2009 low, we had a 79.5% rally through April 23, 2010. The recent 9 day pullback off those levels constitutes giving back 1/5th of that rally. Somewhat surprisingly to most we are still above the institutions favorite moving average of 200 days which is 1095.71. This chart was generated on May 3rd for another project I’m working on and doesn’t reflect last weeks selloff, but regardless the above thrust signals are 90-95% reliable at 3, 6 and 12 month intervals. The last three of the signals are still within the 12 month signal range. The July 23rd signal came with the S&P at 976.25. The September 10 signal came with the S&P at 1044.14. The March 9th 2010 twenty day signal was generated with the S&P 500 index at 1140.45 and has currently flipped negative, but you will notice from the above table, that the previous 7 twenty day signals are solidly 7-0 at 3, 6 and 12 month intervals. From an intermediate perspective, I still read the tape as positive. We are now running trailing 4 quarter earnings of 60.83. With the S&P 500 at Friday’s close of 1110.88, that puts the P/E based on trailing earnings at 19.224. You can see that we have had 5 straight quarters of solid earnings growth and have 12 straight months of increases in the index of leading economic indicators, which suggest that the trend should not reverse soon. Earnings estimates are tough. Standard and Poor’s has vastly underestimated earnings for 5 straight quarters and our guess is probably as good as their’s. If you simply assumed a conservative estimate of a $1.00 growth for the next two quarters, we are selling at 15.68 times 2010 earnings. So over the last 40 years, P/E’s have averaged 20.85, during low interest rate periods, slightly higher at 23.86. S&P 500 is selling at 19.224 times last years earnings. Market is at least reasonably valued at these levels and I would not argue with anyone who argued that it is slightly on the inexpensive side. I believe the psychological events with the previous week will take some resolving, but due to the strong tape action, and the reasonably priced market, we will likely make new highs before the end of the calendar year. I threw this together Sunday and sent it to Babak Sunday afternoon around 5pm E and he did yeoman’s work to get it formatted and out to you this morning. Much appreciated, Mr. Babak. Thanks for your work Wayne! Thanks for this, Wayne. I had no idea that the average trailing PE was so high - I’ve heard 15 or so as a long-term average PE. Are you citing mean or median? When I came into this stuff, I was trained to think 15 as well, but we were coming out of the high interest rate decades of the 70’s and 80’s. With low interest rates the last decade, the trailing 40 and 50 year PEs have risen as stocks have traded in the 20’s for a long period. The median would likely be a bit lower, since the 2008 4th quarter numbers skewed the averages. Wayne, the market valuation statistics are particularly enlightening. Thanks for that. Do you ever look at the 12 month forward earnings estimate for the S&P ( from First Call), which is currently $86.90. The market valuation model I use is somewhat based on this number. Your theory of anomaly re last week was somewhat strengthened today, yet still not completely resolved. I don’t put a great deal of weight on valuation, but in my model, I take an exponentially smoothed average of quarterly earnings and then project my earnings estimate forward based on the trend in exponentially smoothed monthly Leading Economic Indicators to come up with my own forward estimate of earnings. I need to document this approach some day. I have heard estimates of 87ish for earnings and if that were to be the case, you have an even stronger case for equities. Since I was trying to ‘take a look from both sides now’, I was trying to be conservative. In my Dynamic Thrust table above, I mentioned that the 20 day Thrust signals were 7-0 for 3, 6 and 12 months. But you can see from the table that only two of the original signals listed came from 20 day thrust. The 5 additional signals on the 20 day thrust signal came days after many of the 5 and 10 day signals were generated. An oversight on my part for this post. The 20 day signals take a few more days to develop but are very powerful when observed. There is a previous post on those sometime back in March. Anomaly notwithstanding, I’m expecting at least a retest of Friday’s low. But first I’d like to see the short term oversold condition worked off. And the intermediate oversold/overbought indicators are nowhere near oversold yet. yea, but I bet if someone would scan 30 years of Vix data looking for days where Vix dropped whatever x% it dropped today, it would suggest weakness over the next few days. I did scan for Tuesdays after >3% Mondays and they were slightly negative. Couldn’t find many coming off a week like last week though. Tomorrow morning I may scan those 31 capitulation days and see how many retested lows after a 5% bounce in the first week.